In addition to their work as Cubist painters and theorists, Albert Gleizes (1881–1953) and Jean Metzinger (1883–1956) produced Du cubisme, an essay published in 1912 by Parisian poet and publisher Eugène Figuière (1882–1944). This text, which was released in book form to coincide with the inauguration of the Salon de la Section d’Or exhibition in October 1912, is considered to be the first theoretical treatise on Cubist aesthetics. 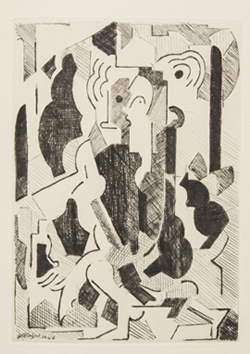 A later edition published in 1947 included an introduction by Gleizes and an epilogue by Metzinger, the former of which delved into the artists' motivations for writing the original essay. These were, according to Gleizes, to clarify and summarise their own views on Cubism, outline the thinking, debates and influences that led to its emergence, justify the Cubist thesis that painting is an outcome of inner reflection and clear up misunderstandings regarding the movement. Last, but not least, they believed that they, the painters, rather than art theorists, should explain what the movement was about. The 1912 edition, which had significant impact and was translated into several other languages, contained reproductions of works by artists arranged in the chronological order they had embraced Cubism: Paul Cézanne, Pablo Picasso, André Derain, Georges Braque, Jean Metzinger, Marie Laurencin, Albert Gleizes, Fernand Léger, Marcel Duchamp, Juan Gris and Francis Picabia. 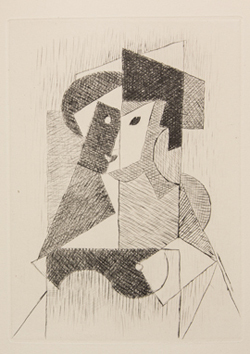 The text of the 1947 edition is supplemented with a selection of eleven prints by Pablo Picasso, Jacques Villon, Francis Picabia, Jean Metzinger, Fernand Léger, Marie Laurencin, Juan Gris, Albert Gleizes, Marcel Duchamp, André Derain and Georges Braque that includes six etchings, three dry points and two aquatints. Although the plates for most of these works had been executed decades earlier, full editions were not authorised and published until 1947. For example, the plate Picasso had etched for Homme au chapeau [Man with a Hat] during the period 1914–1915 was not printed in an edition until preparations for the 1947 book were underway. The exhibition Gleizes and Metzinger: Du cubism (1912-1947) includes an example of the re-edition of 1947 with all the prints. It comes from the collection of the Fundación Juan March and was displayed at its Madrid exhibition space between July and August 2015, travelling to the Museu Fundación Juan March in Palma in October of that year.